John W. Welch is the Robert K. Thomas Professor of Law, J. Reuben Clark Law School, Brigham Young University. He earned a J.D. at Duke Law School (1975), and a B.A. and M.A. at Brigham Young University (B.A. history 1970; M.A. Latin and Greek 1970). He studied Greek philosophy at Oxford University (St. Edmund Hall 1970-72). 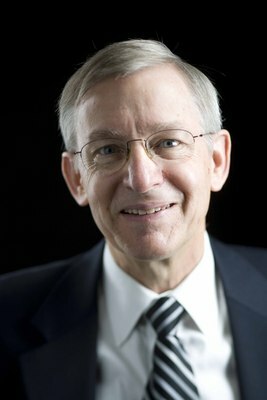 He is editor in chief of BYU Studies (1991–present). He founded FARMS, the Foundation for Ancient Research and Mormon Studies (in 1979), and served as Director of Special Projects in the BYU Religious Studies Center (1986-88). He has been involved in numerous research projects dealing with LDS scripture, history, culture, and thought. He has served twice as a bishop and also as a counselor in the BYU 14th Stake presidency. He is married to Jeannie Sutton; they have four children and 13 grandchildren. The Sermon on the Mount in the Light of the Temple. London: Ashgate, 2009. “Temple Themes and Ethical Formation in the Sermon on the Mount,” Studies in Christian Ethics 22, no. 2 (2009): 148–60. “The Legal Cause of Action against Jesus in John 18:29–30.” In Celebrating Easter, ed. Thomas A. Wayment and Keith J. Wilson, 157–76. Provo, Utah: BYU, Religious Studies Center, 2007. “Parable of the Good Samaritan.” Ensign 37 (February 2007): 40-47, and Liahona 31 no. 2 (February 2007): 26-33. “Miracles, Maleficium, and Maiestas in the Trial of Jesus.” In Jesus and Archaeology, ed. James H. Charlesworth, 349–83. Grand Rapids, Mich.: Eerdmans, 2006. “The Apocryphal Judas Revisited.” BYU Studies 45, no. 2 (2006): 45–53. With John F. Hall and Hugh W. Nibley, eds. Apostles and Bishops in Early Christianity. Salt Lake City: Deseret Book; Provo, Utah: FARMS, 2005. “The Factor of Fear in the Trial of Jesus.” In Jesus Christ, Son of God, Savior, ed. Paul H. Peterson, Gary L. Hatch, Laura D. Card, 284–312. Provo, Utah: BYU Religious Studies Center, 2002. With John F. Hall. Charting the New Testament. Provo, Utah: FARMS, 2002. Hebrew Law in Biblical Times. Ed. Ze‘ev W. Falk. 2d ed. Provo, Utah: BYU Press; Winona Lake, Ind. : Eisenbrauns, 2001. An Epistle from the New Testament Apostles. Salt Lake City: Bookcraft, 1999. Illuminating the Sermon at the Temple and Sermon on the Mount. Provo, Utah: FARMS, 1990; expanded edition 1999. Editor. Chiasmus in Antiquity: Structures, Analyses, Exegesis. 1981; rpt., Provo, Utah: FARMS, 1999; and author of chapter “Chiasmus in the New Testament” therein. “The Parable of the Good Samaritan as a Type and Shadow of the Plan of Salvation.” BYU Studies 38, no. 2 (1999): 50–115. With John F. Hall, eds. Masada and the World of the New Testament. Provo, Utah: BYU Studies, 1997. With Stephen D. Ricks and Donald W. Parry. A Bibliography on Temples of the Ancient Near East and Mediterranean World. Lewiston, N.Y.: Edwin Mellen Press, 1991. The Sermon at the Temple and the Sermon on the Mount. Salt Lake City: Deseret Book; Provo, Utah: FARMS, 1990. With Edwin Firmage and Bernard Weiss, eds. Religion and Law: Biblical, Jewish & Islamic Perspectives. Winona Lake, Ind. : Eisenbrauns, 1990. “The Tree of Life in the New Testament and Christian Tradition.” In The Tree of Life: From Eden to Eternity, ed. John Welch and Donald Perry. “How Rich was Paul, and Why it Matters,” Bountiful Harvest: Essays in Honor of S. Kent Brown, by Andrew C. Skinner, Carl W. Griffin, and D. Morgan Davis. Online publication of Neal A. Maxwell Institute for Religious Studies, Brigham Young University, Provo, Utah. “Echoes from the Sermon on the Mount.” In The Sermon on the Mount in Latter-day Scripture. Edited by Gaye Strathearn, Thomas A. Wayment and Daniel L. Belnap, BYU Religious Studies Center, 2010. “Herod’s Wealth.” BYU Studies 36, no. 3 (1996-1997). Special issue on Masada and the New Testament.